From beneficial microbes to drones, the field of agriculture is a fertile one for start-ups. But young businesses usually avoid working on chemical crop protection. Long, costly development timelines for novel products make it a tough row to hoe. That makes AgriMetis a standout. The firm plans to thrive by developing herbicides, insecticides, and fungicides with new modes of action. AgriMetis was spun out of Acidophil, an innovation firm that primarily creates companies focused on human health. AgriMetis cofounder Brian Green and two of his Acidophil colleagues, Simon Aspland and Philip Goelet, were persuaded to branch out in 2012, after the company was introduced to Syngenta Ventures, the external innovation arm of the Swiss agrochemical giant. 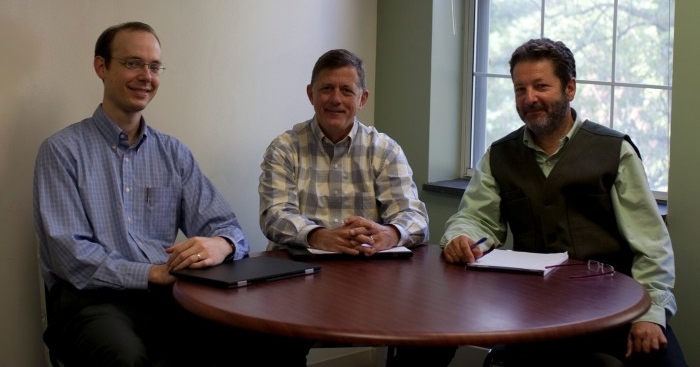 This image shows Agrimetis cofounders Brian Green and Philip Goelet, along with CEO Steven Tuttle (center). From left: Green, Tuttle, and Goelet. Syngenta was attracted to Acidophil’s problem-solving research method. It works with an international network of contract research organizations and institutions where it sponsors research. This virtual model allows the firm to come up with a hypothesis—a new molecule that solves a problem—and quickly test it. “It was exciting to execute the experiment of taking our biotech approach and applying it to agriculture,” Green says. Like in pharmaceutical research, the quest for a new pesticide starts with a biological target. Big companies deploy assays and huge libraries of molecules and compounds to find a “hit.” They devote millions of dollars and several years to refining and testing candidates. In the search for a blockbuster, however, many potential leads are thrown away. That’s where AgriMetis starts its work. To find a new herbicide, for example, the firm searches the literature or polls its research network for a promising target—say, an enzyme that controls weed growth. That network then comes up with a list of candidate molecules that affect the target but were abandoned—maybe they were too expensive or not potent or selective enough. AgriMetis selects three to five that could be rehabilitated into products that work and will sell. Green says AgriMetis can succeed where bigger firms stumble because its virtual research base can create large or complex molecules by pairing biological transformations—metabolic engineering, directed evolution, or enzymatic catalysis—with traditional synthetic chemistry. Wedding chemistry and biology lets the firm chase leads inspired by natural products or derived from them. At AgriMetis, molecule development begins with an agricultural problem, such as trying to kill a weed by targeting an enzyme. After a literature search, the company selects small molecules that showed activity against the target enzyme but weren’t further developed. It works with contract research organizations to improve their potency, selectivity, or cost. After testing and development, a lead is licensed to an agriculture partner for commercialization. So far, AgriMetis is pursuing an herbicide and an insecticide for advanced development. Neither has yet made it into field trials. In July, the company brought on a CEO: Steven Tuttle, a 25-year agriculture veteran and former global business director at Dow AgroSciences. Next up: raising a Series B round of roughly $20 million. AgriMetis’s ties to agriculture giants are an important part of its strategy. Just as large pharmaceutical firms advance leads discovered by biotech start-ups, a firm such as Syngenta can get an AgriMetis crop chemical through the regulatory hurdles, manufacture it, and sell it via distributors.